There’s a moment in “Uprising,” Switched At Birth’s much anticipated all-ASL episode, where all Daphne does is open a door. Something we’ve all done thousands of times. Something we rarely think about twice. But when something as innocuous as her opening the Kennish kitchen door causes a strange commotion among the rest of her family—a commotion shot from Daphne’s perspective, one she can’t understand because no one is communicating with her about it—it quickly becomes clear that for Daphne, even something as simple as opening a door can be fraught with hidden difficulties like unheard burglar alarms. I wanted to single out this small moment not because it’s groundbreaking within the show’s universe (it’s actually a nice callback to moments as early as the pilot) but because it’s so powerful a storytelling device and one the show never overuses, saving it for just the right time to make it count. In an episode entirely told from a deaf perspective, this small moment is still the most powerful reminder that although we may not hear any dialogue, we’ll never truly be able to understand how Daphne feels in this moment. It’s something Melody says to her students in the episode, but it’s never fully processed for the hearing audience until we see the confusion on Daphne’s face when she opens that door, the way everyone moves around her but ignores her confusion (until Toby finally mercifully signs to explain what’s going on), and the way Daphne so obviously internalizes in the moment how she’ll always be different, even within her normally very understanding family. The trick here is this is just one tiny moment in an episode filed with them, buried within a series built around them. 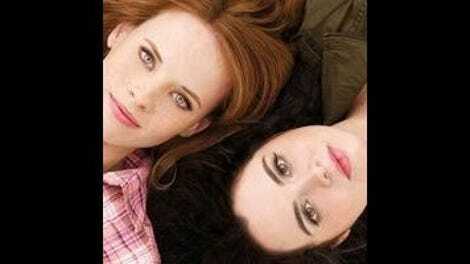 Switched At Birth is that rare show which has the tools to do things nothing else in the current television landscape can, talk about a segment of the population almost entirely ignored by mainstream pop culture, and do all of it without breaking a sweat. It can be difficult for a show to do a targeted special episode like this and not have it feel like a stunt, but sign language and the exploration of the deaf experience is so ingrained in the DNA of the show that after the first few minutes of the episode, I was so engrossed in the story I almost forgot there was no vocalized dialogue. This isn’t a criticism of the episode; in fact, it’s precisely the opposite. “Uprising” is many things at once—a mini history lesson, a character study, a cultural microscope—but it’s never less than terrifically compelling. What makes it work is that it isn’t a sappy afterschool special dropped into the middle of the season out of nowhere; it’s the culmination of an entire season’s narrative, one that has been instrumental in the renewed quality of season two. In season one, Carlton was just a background player, simply a place Daphne and Emmett went to school. By bringing Carlton to the forefront this season, the show created more than an entirely new location. It basically created a new character, and “Uprising” is all about what happens when that character is stretched to its breaking point. Carlton was introduced earlier this season through its new pilot program to bring hearing kids to the formerly all-deaf school, a move that at first simply seemed like an easy way to get Bay under the same roof as Daphne and Emmett on a day-to-day basis. What it turned into, however, was a thoughtful examination of the cultural and experiential chasm between deaf and hearing kids, and the dwindling resources for the deaf in our current educational system. With the school board voting to close Carlton and disperse the deaf students among the mainstream schools throughout the district, it’s immediately clear that these kids aren’t just losing a place to learn. They’re losing a place where they can feel like they belong, a place where they can interact with people who share their experiences, and a place where they can finally feel safe. But where the school board went wrong was they didn’t count on the kids fighting back. In a nice, overt nod to the successful Gallaudet University protests of 1988, Daphne organizes a Carlton occupation of her own, with the goal to have the school board reverse their decision about closing the school. The kids are more than willing to wait it out inside until they get what they want, and their demands are straightforward (keep Carlton open and deaf, with no punishment to those kids who participated in the protest). It’s the process of asking for these demands that turns out to be far more complicated than any of them expected. 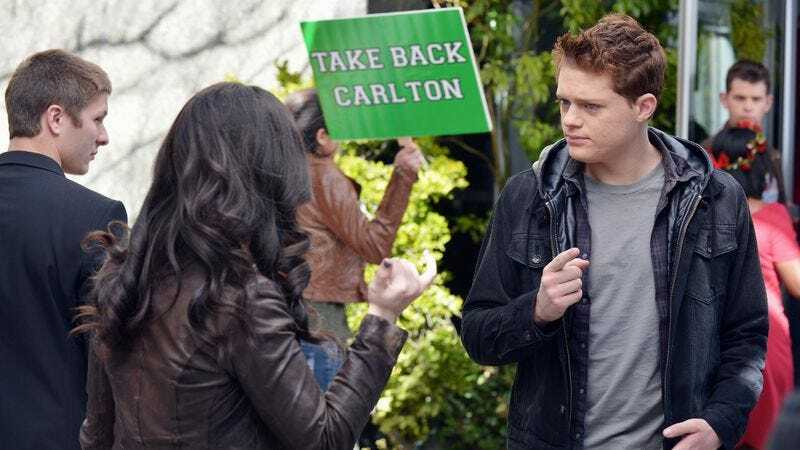 They want to keep Carlton deaf—but how deaf? Is Noah’s Meniere’s disease enough for him to “count”? Bay isn’t deaf but is there fighting for her school. Will she even be allowed to attend if the protestors get what they want? Or is she fighting for a cause her classmates don’t even think she should be involved with in the first place? No two people’s views are 100% the same, creating a nice tension between even the kids who on the surface are very similar. No matter what Bay’s classmates think, though, the moment of real importance here to Bay is what Daphne thinks, and that’s where the episode truly shines. Daphne’s reservations towards Bay and Kathryn’s involvement at Carlton has been something slowly building for weeks now, and it explodes here when she finally admits to Bay that she doesn’t think she belongs at Carlton at all. Bay is understandably hurt by this, emphasizing that you stick up for family no matter what. It’s the word “family” Bay uses here, and it’s a word choice that feels simultaneously deliberate and inevitable on the show’s part. Daphne and Bay have slowly become family to each other without it ever being verbalized, and here it only comes out at the worst time, when Bay is the most hurt and vulnerable. This is a moment that will likely hang over the girls’ relationship greatly in the future, but there’s no time to dwell on it here beyond this one terrific, fleeting moment. The mood of the scene is shattered—along with the silent spell of the episode—with a tilt of Bay’s head. She hears sirens approaching, and just as she begins to hear them, so do we. It’s these sirens, along with Bay’s scared, audible intonation of the sentence “The cops are here,” that brings both the kids and the audience back to reality at the same time. Because although this episode existed in its own silent little bubble, committed to illustrating the value of Carlton by showing the students building a world where everyone signs and everyone understands them, the truth is these kids don’t live in that world. They live in the real world, a world filled with the trials and struggles that come with being different from the mainstream, and they now must learn how to marry those two worlds again, no matter what ultimately happens with the police and Carlton. Carlton is just the place that makes the rest of the world that much easier for them to endure. Beyond the opening scene, it’s a full 14 minutes into the episode before any sound besides light scoring kicks in. When a background song starts playing to accompany Bay’s art montage, the transition is almost jarring it’s so stark, which feels purposeful and really smart. Also smart: The ongoing stories of Daphne and Noah’s barely-there flirtation and Regina’s renewed drinking continue in this episode, adding shading to what could be a very one-dimensional affair without them. I like that at times people are obviously vocalizing (like Daphne trying to wake her mom) but we never actually hear it, immersing us in Daphne’s mind as well as the mindset of the Carlton plight even in scenes where it isn’t the main focus. Melody is a fantastic character, and gets a real chance to shine here between her conflict over needed to take the new school board job and wanting to be true to her belief that the school board is making a terrible mistake by closing Carlton.